There are many different types of switches and outlets to consider when wiring your rooms and homes. We’ll break down the benefits and disadvantages of the most commonplace ones to help inform and guide you in your decision. In most cases, it comes down to personal preference. When you choose DMS Electric as your licensed electrical contractor, we will provide our honest advice and suggestions. However, it is your home and no matter what set up you prefer, we are happy and grateful for the opportunity to provide the switch or outlet installation service. These are the most typical types of switches you will find in homes today. The toggle, being the most prominent, in that you flip it up or down to change from off to on. The rocker or paddle style offers the same functionality except for an a more elegant and modern design. The center point of the switch has a dip with each end curved allowing a person to push it on and off instead of flipping. SINGLE POLE – The most basic of switches. It allows you to turn off and on the electric current from a single location. DOUBLE POLE – Similar to a single pole switch. It too, only allows for one location to shut off the current. However, it is used to connect 2 “hot” wires instead of 1. This makes it ideal for appliances using 240v such as a garbage disposal. THREE WAY – This type always comes in pairs and allows you to shut off current from two locations. There are no on and off markings since the two switches work in conjuction with one another. FOUR WAY – Same principle as the 3-way except it allows for current to be shut off in 3 or more locations. Usually found in configurations of 2, 3, and 4. 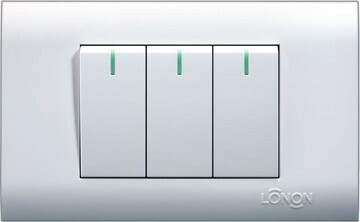 This type of switch allows you to control different fixtures in different locations of the room. Perhaps you want to have your fan and lights separated. Or want certain rows of lights to be able to be turned off and on independently from each other. Pretty much anything your heart desires. You tell us what you want and we at DMS Electric will make it happen for you. Not only does it give you control over the usage of different fixtures, but you’ll reduce energy costs by only having it run what you want on when you want it on. Set the mood just right with a wide variety of dimmer switches. They all perform the same function which is to control the intensity of the light. The real fun, however, comes in choosing which design flows well with your home. Certain flavors include an automatic switch, toggle switch, rotating dial switch, slider switch, and push button switch. Great for a romantic evening or entertaining guests, having a dimmer switch gives you that certain type of ambiance you have been looking for. Although you usually won’t see push button switches in newer homes they can be a great way to maintain the look and feel of older homes from. Typically, from the 1930’s and earlier. Many replica push button switches are available on the market today. Most will fit nicely in homes that are of Victorian or colonial style. Efficiency should be kept in mind if you are deciding on getting a push button switch. Although not difficult to operate, it does not offer the flexibility that a toggle switch offers. There probably have been times where you are hands have been full and having the ability to flick a switch with your arm or elbow has become almost second nature. 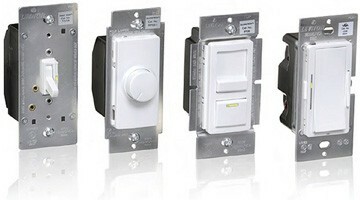 There are other types of switches not mentioned here such as motion sensor and selector switches. Just because you don’t see it above doesn’t mean we can’t install it. If you have ANY questions about having switches placed throughout your home, please don’t hesitate to call us. We look forward to turning your home into a place of comfort and sanctuary. The standard outlet made for everyday use. Because of regulations in the 2008 National Code Book, new construction and renovated homes require a tamper-resistant outlet. This is to protect children from sticking objects into the outlet and avoid getting seriously hurt. They have a shutter mechanism which only allows insertion of properly rated plugs. If you need to know which amperage is right for your outlet, the team at DMS Electric can assist in your decision provided you mention the main purpose of the outlet. It is important that proper wiring is run so that the lines do not overheat and cause a safety hazard. Short for ground fault circuit interrupter, these types of switches are designed with safety in mind. They work by monitoring the electrical current and determining if there is any leakage from the circuit. If there is then a ground fault occurs and the GFCI will trip like a breaker shutting off the circuit and removing the hazard. You will usually see these placed in areas with the high potential for water contact such as kitchens, bathrooms and the outside of exterior walls. It is easy to reset the GFCI as there is a button on the switch that indicates as such. If frequent tripping occurs that usually means there is a bigger issue at hand and you will want to call us right away. Piggy-backing off the above section in regards to GFCI outlets, outside outlets usually have some form of a GFCI with a protective cover to endure the elements. The most common places you will need them are around pools and decks/patios. Different manufacturers offer unique styles for the protective covering. 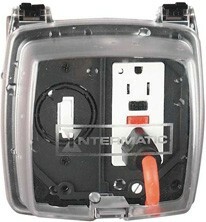 Some choose to have clear casing allowing you to see the outlet and plug. Others have a sleek silver or grey cover which offer better blending with your home. If you find yourself doing a lot of outdoor projects or you entertain in your backyard often, there is no better option than to have an outside outlet installation done. Many appliance manufacturers use a large 3 or 4 prong outlet specifically made to handle the voltage of their unit. There are different types of configurations but the common feature among all of them is that they are all much larger than typical outlets due to the large amount of power they require. DMS Electric can easily identify the correct type of appliance outlet you need and perform the outlet installation as well as connect it to the appliance for you. This can be anything from a stove to a hot tub. In some cases, a dedicated line must run straight from your panel box to the appliance itself. It is important to make sure the right outlet or switch is installed for the proper application. If you are unsure, call (215) 837-7959 for a consultation for your switch and outlet installation needs. It’s free and if you live in Philadelphia we can come out to give you a free estimate for the job.